When the world was introduced to the HDMI cord, it changed everything. No longer were complicated rigs required to support high-definition content and sound. Instead, the only thing you required was a simple cord and the right screen and your content looked its absolute best. The main trouble, however, was that most televisions that featured HDMI inputs had one or maybe two, meaning many people had to get up and physically swap out the HDMI cords when they wanted to use different devices. The other problem was that many businesses had their multiple televisions set up to play the same thing through elaborate analogue rigs. But then came along the HDMI splitter and HDMI switch, devices that helped people beam the signal they wanted wherever they wanted. Soon, HDMI splitters and HDMI switches were being used everywhere for all kinds of reasons. But for those who do not know: what exactly is the difference between an HDMI splitter and an HDMI switch? An HDMI splitter is exactly that: it takes your HDMI signal from a single HDMI cord and copies it, sending the exact same signal to different devices. The HDMI splitters will splice the signal with no loss in audio or visual quality and will ensure that the signal is delivered simultaneously so that the devices show the exact same thing at the exact same time. Splitters are extremely popular in the commercial world, especially in places where multiple screens will be showing the same content. 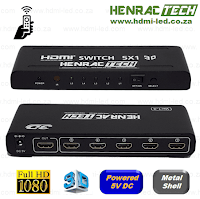 An HDMI switch, as opposed to an HDMI splitter, is a device that helps you easily switch between your HDMI signals. HDMI switches can change the content by sensing when you turn on a device. When you are watching TV and decide to fire up a movie on your state-of-the-art android TV box, all you have to do it turn on the player. The HDMI switch will sense the device turning on and automatically switch to that signal on your television. In general, HDMI splitters are used in the corporate world, businesses where you need multiple screens to show the exact same thing. The most common use for HDMI splitters is in restaurants and bars that have multiple television screens, especially sports bars. For the HDMI switch, these devices are used almost anywhere, from basement man caves to the top of skyscrapers. They can be useful in almost any situation where you have multiple devices linked to the same television or entertainment box. HDMI switches automatically sense when a new device is turned on, making switching between devices fast and seamless.